I was lucky enough to meet the legendary Holger Czukay and Irmin Schmidt of Can while I was at MTV Europe in the mid 90s. Toby Amies had just left to measure Long Island and find his fortune while not cutting his hair in MTV NY and so the show I worked on MTV Alternative Nation was without its captain. Behind the scenes I was desperately trying to get John Robb of The Membranes to present it and also harboured fantasies of Stewart Lee since I’d worked with him on a show called MTV Hot. However, in the interim we managed to persuade a few indie legends to “guest present” some links (way before “Have I Got News For You” swapped Angus Deayton for a revolving door of guest hosts!) and soon after a successful slot with Mouse on Mars and Mary Hansen of Stereolab (RIP) we got in Jan & Andi from MoM’s all-time heroes Can to do us a turn, since they were in the midst of an extensive remix programme with Mute Records that was giving them massive resurgence. Of course Toby and I were already big fans, and the hypnotic videos for “Oh Yeah” and “Mushroom” got many a late night Alt. Nat. spin. With the help of legendary TV producer and magazine collector/curator James Hyman, we came up with the madcap plan of filming the already veteran Holger frantically doing links to videos above the car noise on a tiny traffic island in the middle of Hawley Crescent while being mildly bibbed and heckled. It kind of worked! Later I persuaded Holger and Irmin to sign a press photo and Holger wrote “mind those cars, Nick!” and I loved him even more (while feeling mildly guilty I’d asked an old guy and music icon to risk his life to introduce a video no doubt by someone daft like Presidents of the USA). Just as those memories live on vividly in my mostly addled (sometimes gormless) mind, Can are a timeless band capable of leaving me mouth agape. 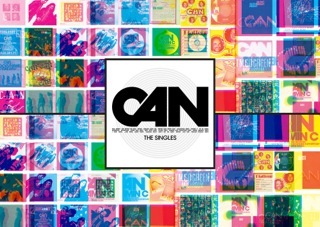 Sadly drummer Jaki Liebezeit died earlier this year but his legacy lives large in this brand new collection of all the singles by Can. Time signatures in tunes like “Spoon” and ones I was less familiar with like “Shikako Maru Ten” and “Turtles Have Short Legs” have such an alien funk about them they could have been made today (or tomorrow which never comes). It’s easy to literally melt into them, drift in and out of consciousness while all the time tapping your foot like a metronome. James Brown talked about the funky drummer and while he didn’t mean Jaki, he should have, as he truly was a wizard with the drum sticks and brushes. In fact it’s tunes like “Shikako” that are subtler and lack the later better known trance like wailings of Damo Suzuki that hit the spot the most for me. There’s a full 23 tracks on here, including all the favourites like the trippy “Halleluwah”, the urgent, foreboding of “Vitamin C” and the winsome, prescient “Future Days” in what is a beautiful looking vinyl package. Also songs like opener “Soul Desert” show a side I was less familiar with, like “Safe As Milk” era Captain Beefheart and the almost lazy finger click pop of Andy Williams (on magic mushrooms, a common Can trope) “She Brings The Rain” means it’s not only a treat, it’s reassuringly surprising. There’s the very odd miss – I’m thinking “Silent Night”, yes that one, the Christmas song which is given an unwelcome workout, but overall, this album, complete with reassuring crackles and a warm fuzzy glow straight out of the recording studio, is a fantastic addition to any vinyl junkie’s collection. In spring 2018, Faber & Faber are publishing a new book devoted to Can, All Gates Open. The special edition will come in two volumes: one will be the first complete, authorised biography of the band written by Rob Young and the second, Can Kiosk by Irmin Schmidt, is a collage of thoughts, visuals and interviews (interviews collated by Max Dax and Robert Defcon).